Home » Articles » Top 3 Easy Natural Allergy Remedies that Work! This ‘Top 3 Easy Natural Allergy Remedies’ post is sponsored by iHerb. I only recommend products that I have personally tried and believe are of value to my readers. All opinions in this post are my own. Which natural allergy remedies are best? These top three picks are backed by research to help keep those annoying seasonal allergies at bay. I have suffered from minor to severe seasonal allergies at various points in my life. The worst it’s ever been is when I’ve visited my aunt out in the countryside in northern California during the springtime. I love being out in the countryside to relax, but during the spring I used to get so much sinus blockage with sneezing and watery eyes that I just had to get out of there! Get A Discount On Natural Allergy Remedies from iHerb! I order so many supplements and herbs from iHerb since they are so affordable and they ship super fast! 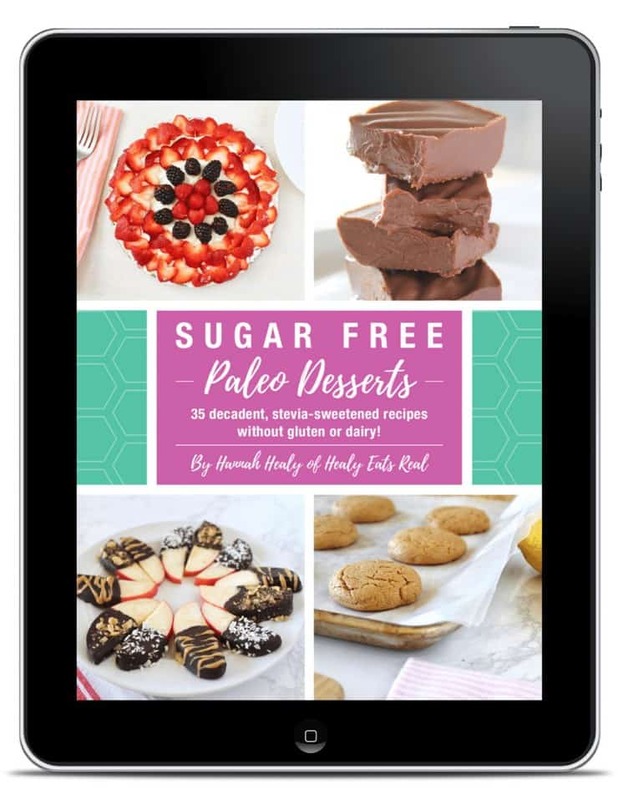 They also have lots of specialty paleo and keto foods and baking supplies too. iHerb carries over 30,000 natural products and ships to over 150 countries. All orders are shipped from climate-controlled distribution centers to ensure the quality of products. iHerb also offers customer service 24 hours a day / 7 days a week in 10 different languages. New and Existing Customers can get a discount off their iHerb order with no minimum purchase by clicking here. Click here to get a discount on your iHerb order! Pollen sticks to bees while they are collecting it from flowering plants. They bring it back to the hive and it combines with enzymes, honey and other substances to create a natural superfood. Bee pollen is so popular in health food circles because it contains so many nutrients which can be hard to find in other foods. Some of these include B-vitamins, amino acids, quercetin and iron along with other trace minerals and plant sterols. 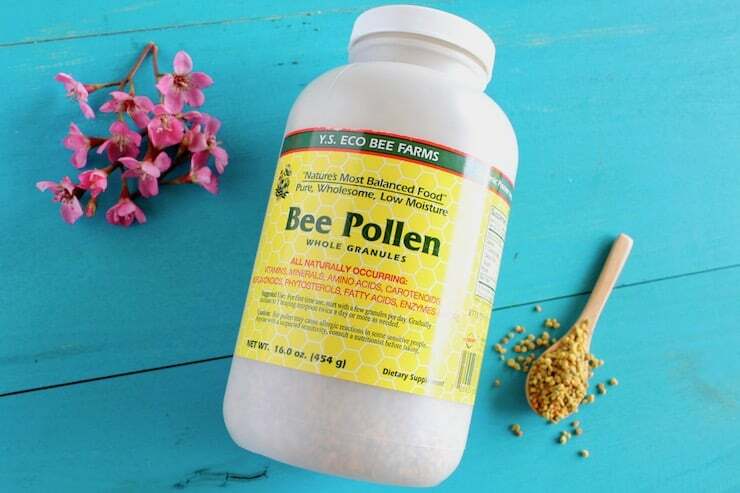 Bee pollen is one of my personal favorite remedies for seasonal allergies. I tend to get allergies in the spring and one of the first things I go to is bee pollen. Now I just start to add bee pollen to my food every day when spring comes whether I have allergy symptoms or not as a preventative. 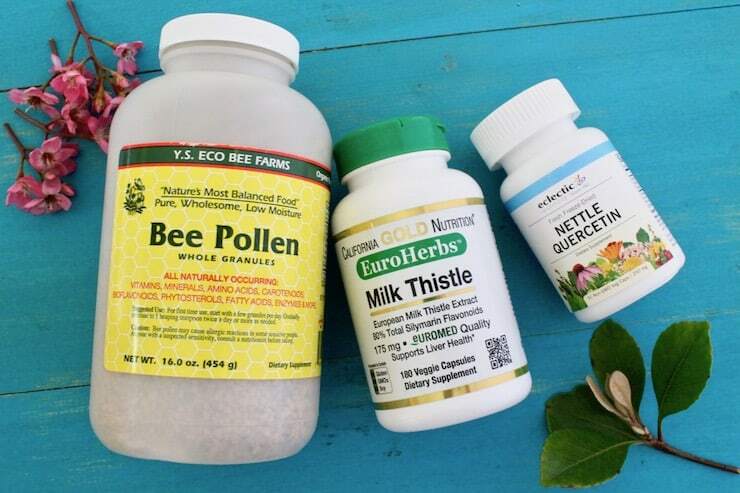 Taking bee pollen is thought to help allergies by desensitizing the immune system to the allergen. 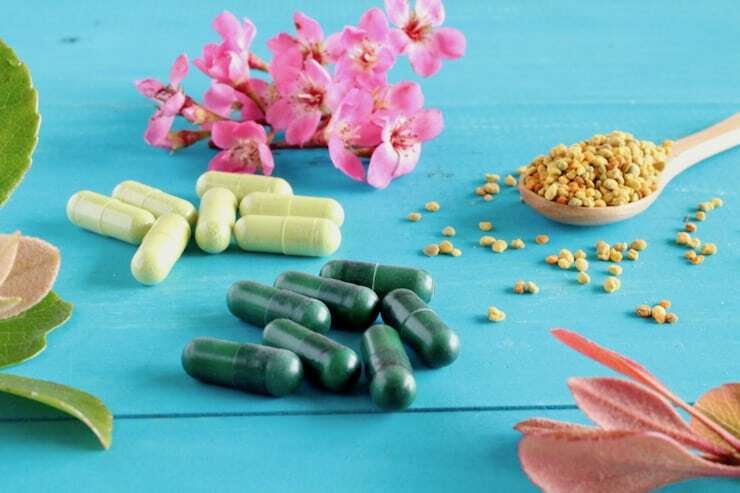 There is some concern that those who are allergic to bee stings may be allergic to bee pollen, so if you are allergic to bee stings be sure to consult a doctor before trying bee pollen. If you are new to bee pollen start by having a few sprinkles and see how you feel. If you tolerate it well keep increasing the amount until you get to 1 tsp twice a day. Bee pollen has a slightly sweet honey-like flavor so is perfect in a smoothie or on top of yogurt or granola. Nettle comes from the stinging nettle plant that you may have heard of before. Although the plant can sting, when prepared in a supplement it is safe to take. Nettles have been used medicinally for centuries to help with a variety of health concerns including seasonal allergies. One randomized, double-blind study found that freeze dried nettle reduced hay fever symptoms for 58% of people within one week. Traditionally nettle was made into a tea, but now the best way to control your dosage is with a supplement. Freeze dried nettle is best. 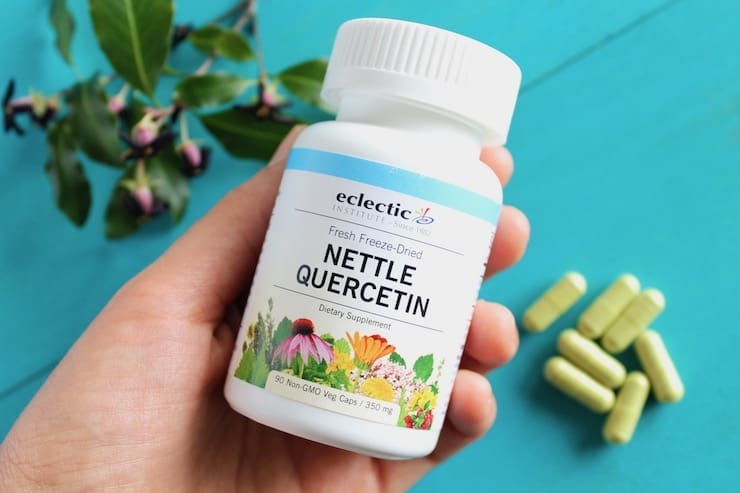 Quercetin is a flavonoid that comes from plants and may prevent the release of histamine in the body which makes it an ideal supplement for allergies. When nettle and quercetin are combined it’s no surprise that it would be an ideal natural remedy for allergies. A common dosage is 2 caps 2-4 times a day taken with a meal. Be sure to talk to a doctor before any new supplements especially if you are pregnant or on any medication. 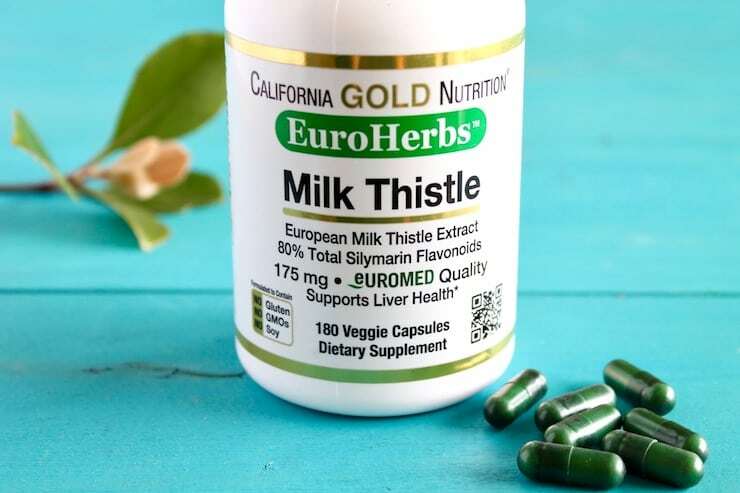 The milk thistle plant’s active ingredient is silymarin which has been studied for its antiviral, detoxifying, anti-inflammatory and antioxidant abilities. Milk thistle helps to support and detox the liver. Because of this it can help the liver deal with allergens more productively. Most people do well taking 175mg capsules 1-2 times a day. As always be sure to contact a medical professional when starting new supplements especially if you have diabetes, are on medication, are pregnant or have health issues. Since everyone is different people may have more success with one natural allergy remedy while another person may prefer another. I find that if you are new to a supplement it’s best to start slow and work your way up to the regular dosage. Give it 2-4 weeks to see if it’s helping. If it helps, great! If not, try testing out another supplement for allergies. 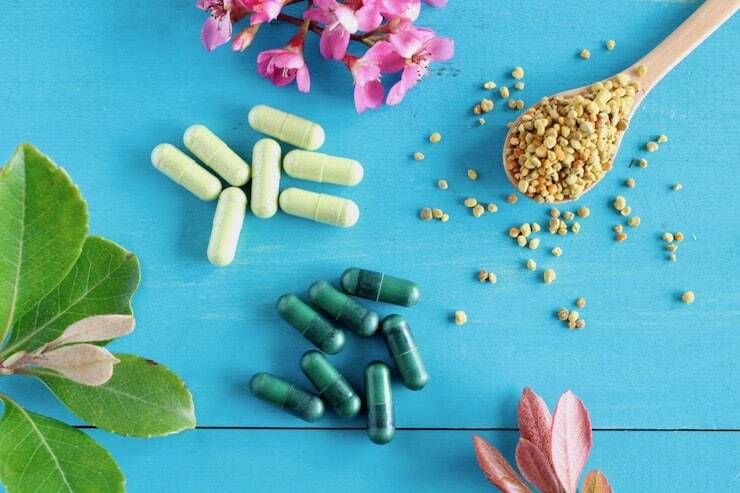 Don’t forget to check out iherb for quality supplements! I’ve never heard of these before but I am going to have to look into them! The remedy works so well and I have them all at home. I am so lucky not to suffer from allergies, especially as I love to spend time in the great outdoors. However I do know of a few other ladies that also do a fair bit of hiking that suffer from allergies and I will forward this info to them. Anything that will help allergy sufferers is a great thing! I have allergies so I am glad I came across this post. I have never heard of milk thistle so I need to do more research. Thanks for sharing. Bee Pollen is a must try product. I always wanted to try this and I have heard a lot about this before and been looking for this one. This is so important, especially during the spring! I have never heard of them before but these i guess are really good. I’ll check them out. Never have heard about these products! 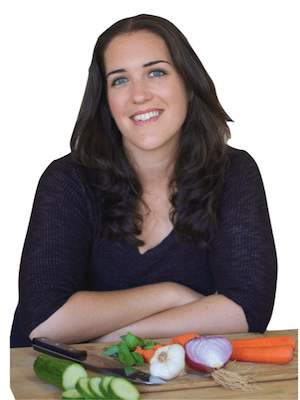 It’s a good resource that you can have natural remedies for allergies! My husband gets really bad seasonal allergies. I’ll have to introduce iHerb to him. I’m a big fan of supplements. I like to try natural alternatives to prescriptions any day. I did not know about these, however. Thank you for the information! I haven’t heard of some of these but these are great natural ways to help with allergies! Will have to try them this spring season!